This Ateco 404 white, large coupler allows you to interchange standard sized tubes and small tubes without emptying the contents of your decorating bag to save time and labor. It accommodates 9/16", 5/8", and 11/16" pastry tubes. In addition, ridged edges on the ring allow you to easily assemble the coupler to the base with minimal effort. Ideal for bakeries, cake decorators, coffee shops, and anywhere else you need to decorate baked goods, this plastic coupler will get the job done! i must give a 5 star review to this Ateco 404 2-Piece Large Plastic Coupler because of its material is very resistant, white plastic the price does not match the quality !! Nice and large. Good quality even though it's plastic. Coupler fits together well, and fits the large piping tips perfectly. Would buy again. Great value. Good quality. These couplers are big, they're perfect for Russian piping tips since Russian tips are usually big. Using this coupler allow me to replace the tips without making a mess. The coupler is a must for piping. One piece on the inside of the bag, and the other works with the tip, screws together easily. It comes in small, medium and large to fit different tips. Excellent. Even large / jumbo piping tips can get clogged when I'm piping cupcake frosting so I love having a coupler that fits those tips like this one. Of course it's also great to have for times when you might want to use 2 different jumbo piping tips for different designs using the same frosting. Great product for a great price. I bought these for my Russian flower tips and it works great! It’s nice being able to quickly change my Russian tip. I couldnt find these anywhere else! So worth the money! LOVE this product. This makes frosting and decorating a breeze. Fit the bag with this coupler and you can change the tips out as many times as you want without having to fuss with a separate piping bag each time. This coupler is huge (about 2" tall) but in a great way! The perfect size for using large tips. I use it with my Ateco 809 round piping tip and Ateco 849 closed star piping tip when I want jumbo frosting on cakes and cupcakes. Don't assume these will fit what you need them for. Make sure you note the measurements and what tips they'll actually work for! I ordered them and can only use them on one size that I even own. They are comically big. They do work great, totally my fault for not seeing how big they actually are. I honestly don't know if I will need a coupler this size, but I was getting the standard and medium sizes so I decided to add this to my collection. Yet to try it out but am sure it will not disappoint when I do. These couplers are huge but very nice when decorating cupcakes. I love being able to change out tips instead of having to use multiple bags. The Ateco tips are very well made of sturdy plastic as well. im a beginner to the cake and pastry decorating hobby and decided on this brand due to cost and a recommendation from someone.im very happy with quality of them. This Ateco 2-Piece Large Plastic Coupler, works great with our Russian tips, plastic is thick and sturdy. Easy to clean, parts engage perfectly, easy to store because of their size. The perfect coupler for switching out those large tips. I love using them with my Russian piping tips so I can easily make different flowers with the same color frosting. these large couplers are absolutely fantastic. with my large tips. I even bought more large tips. easy to use the same as the others. I mainly use these when i use my 18inch piping bags. We bought this coupler to squeeze puff dough. The set is easy to use and easy to clean. Very happy that we gave it a try! The 2-Piece large plastic coupler is very good quality. The price is great. Fits perfectly with my large Russian rose tip. I'm happy with this purchase. I bought these to use with my large cupcake and Russian piping tips after realizing they were too large for the medium couplers I bought previously. They work perfectly in a large piping bag. The Ateco 404 2 Piece Large plastic coupler is a great piece! It fits securely & snuggly! You can’t go wrong with this little coupler! These are the couplers you need for the russian decorating tips and they are not found in cake supply stores. I was glad to find them here and they work perfectly for what I needed! They are much larger than what Wilton would consider to be "large". I would recommend purchasing tips from here rather than a craft store. They are the same price. These couplers are also more affordable than purchasing from a craft store. These are great for using with 11/16 size piping tips. especially if you need to change tip in the middle of piping, you can just remove the screw part of the coupler and put in the tips you want. Large tips seems to be less common compared to the other tips, that’s why I was glad to find this large coupler. It’s not common to see other places, but I’m happy that it’s available at Webstaurant. These Ateco couplers are wonderful for piping tips. It makes it easy to change out the tips (large and extra large) without having to change out the whole bag. Atecos large plastic coupler makes it so easy to switch between large tubes and tips without changes the icing. once screwed on, it holds the tips securely no matter how much pressure you apply. These large plastic couplers are great! They fit perfectly with the extra large Ateco tips, and make switching tips a breeze. They are easy to clean and nice and sturdy. These couplers are perfect for large/extra large piping tips, making it easy to change out tips with the same frosting without having to use a whole new bag. Great coupler for those large and extra large piping tips. Easy to thread and clean. Ateco products are superior quality and this item is no exception. These couplers make it really easy to change out my large pastry tips while decorating cupcakes. I find them especially useful when making large batches where I am changing colors/tips frequently. These are extremely durable, made of nice thick plastic and are dishwasher safe. I use these for all of my large frosting tips that I use to decorate cupcakes or pipe whipped cream. I would absolutely recommend them. Ateco makes great products and these large plastic couplers are no exception. They are easy to insert in piping bags and they thread great. These couplers are perfect for my larger piping tips that I use for cupcakes, cakes, cookies. This coupler is exactly what I expected it to be. It is large enough for big jobs while still being able to fit some of my smaller pastry tips. I would recommend it. I am the happy customer! So glad I bought this coupler, it makes my icing easy to do. Less messy and prevent icing comes out from pastry tube. Working with these couplers makes it easy to change out large tips, and also does a great job of securing the tip into the pastry bag. Great quality and price. A bit larger than I expected. Does not fit my one inch piping tips so be aware of that. However for larger tips this works great! Well made too. This is easy to put on and off. It fit's so well and its very easy to clean too. This is another quality product from Ateco. I thought I would use this but because the size is so large it takes up too much of the bag to just apply it. I just work without it. I love this Coupler! I use it with my Ateco 788 12 Piece Plastic Pasty Tube set. The large tips fits this coupler perfectly. It also fits Russian Tips perfectly! Great coupler, a must have with the large pastry tubes that I use constantly for decorating cupcakes. Sturdy and washes up easily too, everyone that uses large tubes should have a few of these. At this price you can afford to buy extras because you can never have too many couplers! I use this with the "Ateco 786 12-Piece Stainless Steel Large Pastry Tube Decorating Set (August Thomsen)". These couplers works very well and looks like they will last for a long time as they seem be very durable, I also ordered the large Ateco pastry decorating set for using with them. Ateco did it again! The large 404 coupler allows me to interchange the Russian tips. It's amazing and very convenient. I really love this product! Makes swapping out those large tips much easier. Ateco quality as usual is more than expected at a good price. These large couplers go well with the Ateco 786, the 12 piece Large Tip Set. This is large and awkward to use at times. But as it fits the larger tips I have to use in my bakery, it does what it is supposed to. Great for making cookies! I use it with the Ateco 4721 clear disposable pastry bags. Convenient to clean after use. I clean with warm water and soap. Great tool, allows you to quick change the large style tips like you can find in set Ateco 786. Handy to avoid mess or multiple bags if you want to do multiple patterns out of a given color etc. I love this large coupler. It works well with all the larger tips that I couldn't find a coupler for. It's very sturdy and holds up really good. Very easy to wash, and overall just awesome. Ateco has the best couplers and these large ones are no different. Good bevy plastic with nice even grooves. Buy these in bulk with piece of mind. This is a very large tip and proved to be unnecessary for most uses of a pastry bag. (Whipped/butter cream) But for thicker items, such as potatoes it is essential. The Ateco 404 2-Piece Large Plastic Coupler (August Thomsen) is excellent. I didn't even know these existed until I noticed them on this site. They make changing out the pastry tubes very easy and you don't have to change out the bags. I highly recommend this coupler, it's amazing! This large ateco coulpler is great for frosting cupcakes. Just make sure you have the proper sized tip for the coupler. The coupler does it's job great. I will definitely order more if needed. This Ateco 2 piece large plastic couple is one of the favorites. I love using the larger tips for decorating cupcakes and now I can change the tips without emptying my icing bags or using multiple bags. Must have. I really love these very heavy duty couplers. It makes my work so much easier by allowing me to use one bag and switch the tips as needed. I highly recommend getting a couple of these. It accommodates 9/16", 5/8", and 11/16" pastry tubes and is Webstaurant’s recommended coupler to use with the Ateco 18” clear disposable pastry bags. I use this coupler with the Ateco #9 plain 11/16” pastry tube. I’m a home baker, so I like using larger tips because I can frost more in less time and get a professional look with minimal effort on my part. This coupler is super easy to use! Makes changing piping tips a breeze. Good quality, a very solid product. I would definitely buy it again. 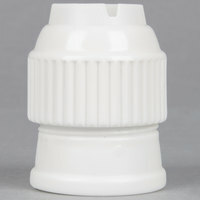 This Ateco 404 large plastic coupler is great for those really big piping tips. It is easy to use and a breeze to clean. I would recommend. if you use ateco pastry tubes (piping tips) and ateco bags, these couplers are always the perfect fit. they're the best for when you do a lot of piping and need to change tips quickly and easily. Love these very heavy duty couplers to hold my tips. I do use them with my disposable bags with ease. The price is unbeatable. It's a win-win. This 2 piece coupler works perfectly with the large Ateco plastic pastry bag. The larger piece goes inside the bag, then the metal tip is placed on the outside of the bag, and the collar screws on over the metal tip to keep the tip in place. This was a larger tool that I needed and webstaurant delivered. It is of great quality and is my go to tip holder now. I use it for larger piping and it is great. Great larger plastic coupler for larger decorating tips! Its really sturdy and heavy duty! Price is great. We recommend this product to any pastry chef! It is a handy item to have if you are planning on switching tips on your pastry bag. It has sturdy, quality construction and is large enough, so you can easily clean it out. We use mostly large tips to frost our items and these large couplers are hard to come by. Now that we have them it makes the job so musty easier thankfully we found webstaurant to order these when we need to. I love these couplers. The quality is so much better than the Wilton brand I have always used. I will definitely be buying more in all sizes. Great coupler and works well with both my plastic and cloth bags. I purchased extras in case one would break- I think I will lose it before I would break it. These large plastic couplers are perfect for use with large pastry tips. They work well with reusable & disposable pastry bags and make it very easy to switch between tips using the same pastry bag. Reminder--these are for large pastry tips only, not for use with regular size! I love these coupletrs! Made of high quality plastic, they are quick and easy to thread. Easy to clean & they are sturdy enough to be run through the dishwasher. Great quality and arrived in perfect time to use on the ruffle cake. Worth using when I get busy and have to make ruffle, rosette, or other type of cakes needing large tubes. Perfect size! I have been looking for the biggest tips I could find. And I have found them. This makes putting frosting around the entire cupcake much easier! These couplers are AWESOME! I love having these around to put into my bigger bags for my bigger tips when I decorate my cupcakes. I have been looking for these and am so glad that I finally found them! Highly recommend! My Russian tips use a large coupler. My set of them came with only one and a large tri-coupler. I wanted another. I will be purchasing more of these. They are sturdy and clean well. This coupler is great for your large piping tips. It is great quality and a great price. You will need a large piping bag though, as this coupler takes up so much space. I first used this coupler with a 12 oz. piping bag and it was much too small. Ateco 404 2-Piece Large Plastic Coupler (August Thomsen) are a great product! Very sturdy and durable! Love these couplers for piping bags and tips! Works Great! These fits perfectly with my tips. They're easy to use without rocket science!! I like simple and hassle free products and this one is just that, hassle-free!!! I AM SO VERY GLAD THAT I BOUGHT QUITE A FEW OF ALL 3 SIZES OF COUPLERS (YOU CAN NEVER HAVE TOO MANY)..THEY ALL HAD A GREAT PRICE AS ALWAYS HERE...THEY ARE ALL MADE WELL AND WORK GREAT AND WASH UP SO EASILY AND QUICKLY...FAST DELIVERY TOO. Nice quality of large coupler. I tried to use it with my Wilton's tips and it worked OK but not as perfect as if you use Ateco's tips. Very sturdy, good price. This large coupler fits perfectly with the large tips that I also purchased from WebstaurantStore. I will definitely be buying more item from here again! Biggest coupler available on webstaurant, this thing allows plenty of high volume flow and does a good job sealing as tips as changed. Good to have. It was great to be able to find this product on Webstraunt. We do high volume cupcake and other cake decorating, and I was only able to find the small sizes at the local stores. These couplers work great for the most part! I have found when mixing it with Wilton products, they sometime leak. So try to keep the Ateco sets together. Most people say you don't need couplers for large tips, but using a coupler you can change the tip without changing the pastry bag and that prevents a lot of mess. So, if you are using different tips and have a large pastry bag, I recommend this coupler. I'm really happy with my purchase. professional quality and easy to use. use for icing large cakes and for cupcakes. easy to clean very durable and well made. have purchased in other sizes and always happy with the results. Ateco 404 Large Coupler (August Thomsen) is for the x-large decorator tips. I wish they had the lids for this size as well as the small ones. I bought this item on a whim because I normally don't bother with a coupler when using the larger tips. It is as expected, a good quality coupler by Ateco. This large coupler is a great, sturdy piece that will last you for a while. It fits the large head pastry tubes perfectly and rounds out my cake decorating set. We love these couplers for our large pastry bags! When we are piping a cupcake, or filing potato skins with mashed potatoes - this coupler is sturdy enough to hold the bag and allows us to interchange our tips. I bought this large coupler to use with my larger pastry tips as an easy way to dispenser batter into muffin pans. I simply fill a large pastry bag with cupcake batter, screw on a tip and coupler, and it allows me to control how much batter I put in each muffin liner without creating a mess! Very well made, very sturdy, cleans well and holds all of my favorite piping tips. Whats not to love? Cant beat the price either! Will reorder! This large coupler securely holds my pastry tubes. i have had no problems with leaking. Even with thin icings or glazes. I am very pleased! Perfect for my large pastry tips that I bought from you. The prices are fantastic and can't be beat. Everyone should own these when using pastry tips. As a pastry chef it is easier to remove the tip and not make such a mess with the buttercream or frosting using. Thanks very happy with purchase. Ateco 404 Large Coupler (August Thomsen) fit perfectly when using the tip and pastry bag. This is a great product for the price. I will buy again, if needed. This large coupler gives me versatility that I previously did not have with my large bags and large tips some of which I received from Webstaurantstore! I bought a couple of these couplers (hoho, wordplay) in order to make it easier to slip out my piping tips from my piping bags, and they're definitely fulfilling their job. I still have them, and I'm glad they haven't absorbed any smells from anything I've piped (which I was worried about seeing as how this is made from plastic). These work great with the jumbo pastry tubes! I mostly use them for decorating cupcakes. They are such a Great price too. I'll be ordering more! Coupler seems to be made with sturdy plastic, screws in smoothly, and is very easy to swap frosting tips. Plan to buy more in the future. I am so happy to have this Ateco large coupler- its so good to have when frosting with many tips with the same color. Great! Fantastic, works exactly as expected. This coupler makes it easy to switch tips/tubes after filling the piping bag. Compatible with large piping tips, which are perfect for frosting cupcakes. Very durable for being a plastic piece. Essential for large piping projects, be they fillings or frostings. Quick and convenient switch out for different tips. I love these for ease of changing out tips on my piping bag from one cupcake flavor to the next. They thread nicely and are easy to clean! I prefer Ateco products over Wilton. Ateco builds sturdier higher quality tips. This one was larger than what I needed, it was too big to fit my cupcake swirl tips. Thats ok, great price anyway! This Ateco 404 Large Coupler works well. It's well-made, and it helps when icing cakes using the large decorating bags also sold on this site. This works great for large pastry tips. I was a little surprised and a lot pleased to find this coupler at webstaurant because it seems tough to find anywhere else. I have not been able to find this large coupler anywhere else. I often use large size tip when piping whipped cream, and this coupler is the perfect size. I would make sure that you have tips that fit this size. The large ateco is very large and would not fit your average tip size. This is great for filling and evenly putting on icing on large cake. Durable and great for larger job. I use couplers all the time and these are great for larger tips. This fits perfectly with the Ateco #9 tips. It adds stability to your tips, especially when using a disposable bag, and makes changing out tips such a breeze. These are super big and sturdy and work great with the 808 and 809 decorating tips. We love that we purchased them for our bakery. Perfect larger size to use in my big pastry bag! Not an easy size to find in store so i'm happy I was able to order it here. This Ateco Large size Coupler is truly LARGE. If you're not sure if you will need size Large, make sure to order a Size Medium Ateco Coupler set as well. The large couplers are great for both the Ateco disposable bags and the nondisposable bags. They work nicely on large cakes specifically wedding cakes that need a great deal of piping. They are also quite easy to clean which is good in this business. A large coupler for a large job. I love the Ateco tips and this makes switching decorations a breeze. Simply insert the coupler in the bag, add your buttercream and attach your decorating tip. When you want a new design, switch to a new tip. Simple. These large couplers are a miracle, I have been using piping tips for so long with just a bag and this has made it a breeze to replace tips. These large couplers worked great with the Ateco large tube decorating set. Great price and easy to use. I Would red come d to others. Love the large couple and large tips. Getting older and not wanting to take all the time I did when I was younger. My daughter is partial to the smaller, good thing, she needs the basics. Great coupler, fits nice a tight. Love Ateco! Wouldn't be without my Ateco 404 Large Coupler. Makes changing large tips a snap. I enjoy the extra stability I get when using a coupler with my decorating tips. Great coupler and always handy when I'm using a lot of different tips and don't want to switch out my piping bags. I would highly suggest stocking up! These are a great time saver for anyone that has to change tips on the same bag repeatedly. Clean up on these are a breeze, just put them through a dishwasher. Great for bakers who need to change their piping tips often. They are made from quality plastic and haven't shown any wear in the months that we have had them. Would definitely purchase/recommend them to anyone. I absolutely love these couplers. It makes using a wide variety of tips to decorate a cake effortless and is a time saver. It also prevents you from having to use a million pastry bags. We overlooked these before, but if you've never used one, you need to. It may seem like extra hassle to attach the coupler to your piping bag, but once it's done, you can switch piping tips easily. These things are great. I love how well they work. Easy to screw on, off, and just a quick change for a new tip. Just be sure you get the right size for the tips and bags you're using. This one is quite large. Be sure you have all the same sizes for tips., as the difference between a large and a medium is substantial, and it just won't fit. These are easy to clean, as well, and I just toss them into the silverware rack on my dishwasher, and they come out clean as can be, easy peasy. This is the most reasonable deal I have found on large couplers! and the quality is insane! :) the large tips are awesome for cupcakes.. I will be ordering more soon! Ordered this to accompany my Ateco 809 11/16" Plain #9 Pastry Tube. I don't know what I was expecting, but I did not know it would be this huge. Perfect fit for my new pastry tube. I would probably suggest using at least a 18" bag, however. Ateco 404 Large Coupler. This coupler is necessary to easily change out the largest pastry bag tips in the catalog. I trim my pastry bags to fit and leave this installed. Ateco 404 Large Coupler (August Thomsen) fits 16 inch bags perfect. they hold a lot of pressure when you squeeze the bags. Very happy with the price and quality of these. Great coupler that does the job well. These are very large, so make sure you really need the large ones before ordering. These are too big for normal decorating tips. They are very strong and work great. The large coupler is the largest size you can use. If you are looking for the coupler that fits the large tip that you can purchase from your craft store, ie 1M tip, this one WILL NOT fit. Great quality though too large for my current tips. It is a big help when doing large cakes or a lot of decorating. I use these with the larger bags and the big decorating tips. Saves a lot of time and the pain in my hands. Ateco to me is better than wilton product and you can get from webstauant ! More selection and cheaper prices. I paired this with a larger tip... Made icing cupcakes a breeze! I was shocked to say the least when this coupler came in. The quality is wow, The size is wow, now I can use my bigger tips cover them and switch them as needed. Great buy! The Large Coupler I bought is great for my large decorating bags and large decorating tips. Performs well and no leakage of icing from the coupler. This large coupler worked great for the # 9 pastry tube that I purchased from this site, it worked great with the pasrty bag that I used, and fits others that I have purchased in the past. I use the Ateco large star (# 829 & 849) and large plain (#809) tips for decorating cupcakes, and this coupler makes it very easy to switch between tips. I bought these couplers along with the Ateco tips and both are great quality and very sturdy, even for thicker consistency icing. I would buy them again. This is a fine coupler, though I don't see how it works with the sizes of tips noted in the description. This coupler is for the really huge tips used for frosting large cakes. I wanted one that worked with the Ateco 809 and 827 tips, and this one is too big. Unless I was mistakenly sent the wrong one? This Ateco brand coupler works well with any style pastry bag. It makes it easy to get a perfect seal between the bag and the decorating tip, no leaks. Perfectly fits the individual large tips sold on this site. Have used it to hold the #9 large star tip when piping out pate a choux for eclairs. Some people do not use a coupler for the large tips, but I prefer the more secure hold a coupler provides while piping, especially a large batch in a large pastry bag. A must-have when changing large decorating tips or pastry tubes. I have used a decorating bag without a coupler and usually end up needing to change a tip which means filling another bag. Ateco is a great brand and these work perfectly. I purchased 3 over 6 months, use them every day and have they are holding up great! Ateco 404 Large Coupler very sturdy, good quality plastic coupler. Great fit for Tube Pastry #7(open star and closed star) I've purchased.It closes tight. Very satisfied with that purchase. The Ateco 404 Large Coupler is great work's well with the ateco decorating bags. We hjave a large coupler with each 18"bag .You don,t have to refill as often. This I ordered for the use of making cupcakes this. This is a must have for any cake or cupcake decorating. The large opening can be used to make full frosted designs. Ateco large coupler works great with the Ateco large tips. Make sure you get the 18" or larger pastry bag when using these tips so you don't have to refill the bag constantly! Every pastry chef needs several of these in his or her tool kit. They are essential in cake decorating. They make it very easy to switch tips quickly and keep the same pastry bag. I HIGHLY recommend this product to anyone, professional or in-home, interested in making cakes. This product allows you to flawless make multi-flavored cakes without any run or breakage. Love this large Ateco coupler! Makes switching pastry decorating tips very easy! Easy to use, even easier to clean! Very inexpensive and worth every penny!! Great coupler for the larger almost extra large sized tips. This sized couplers are hard to find in stores. I have a number of them so I'll have different tips on each bag when decorating. Well made thick plastic. I was so excited to find a couple that fit my large Ateco party tips and at such a great price to boot! I will be stocking up on these bad boys! Great coupler!! The price was wondeful and this large coupler is a good size for the larger pastry tubes i purchased from this site. Fit perfectly!!! This is a necessary size coupler to use with certain tips. It's well made and super durable. No compliants whatsoever. We don't find it super useful because most of our tips we just drop in the bags now rather than mess with the coupler, but as far as quality goes, this isn't a cheap plastic! Works very well. Holds up to our students' use & abuse.